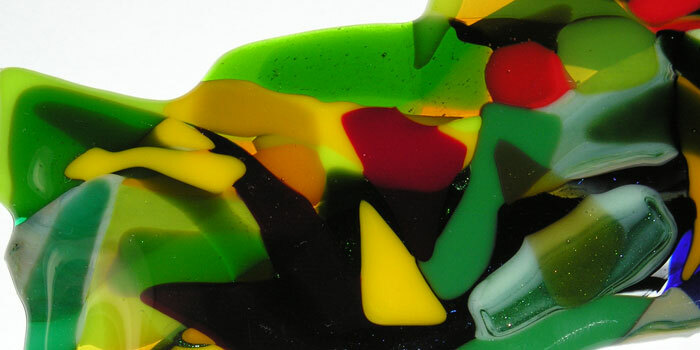 There is one rule in working with glass; never throw anything out. 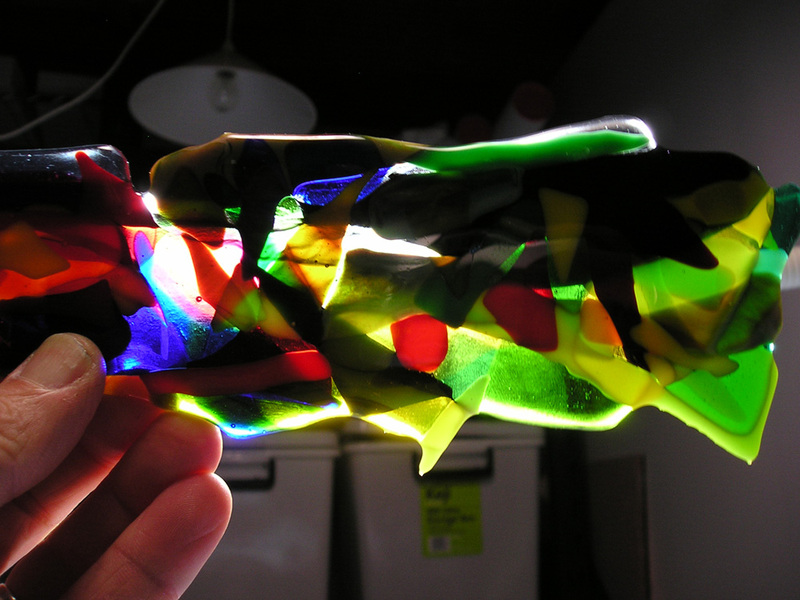 Fusible glass is not cheap and you can always make something of all those little bits and pieces you will have left over. I say ‘will’ because this is inevitable. We have containers of small offcuts, in all colours and patterns, transparent and opalescent. Something I would love to try sometime in the future is to melt a stack of these in a dam and rake them with a stainless steel rod. I think the result would be fantastic. But that will have to wait. This time I decided to simply pile up a stack of offcuts and fuse them all together. The intention was to create a swirl of colour in a slab that could then be cut and cold worked for jewellery features, such a cabochons. The preparation was very simple; clean all the pieces and then pile them up. Not hard. The only attempt at designing the puddle was to concentrate similar or complimenting colours together. You can see in the ‘before’ photo I tended to concentrate red and yellows at one end, then slowly introduced some dark colours and blues, through to greens at the far end. 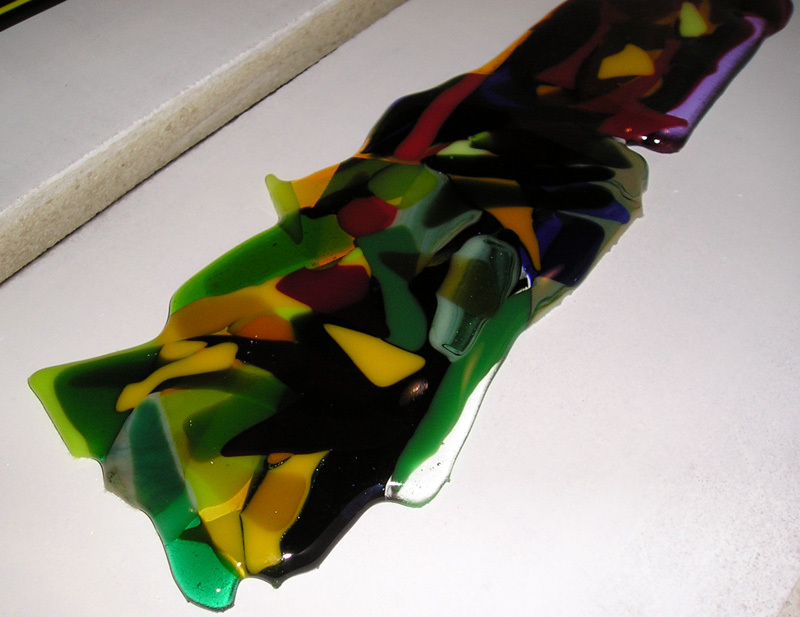 I did try to scatter transparent glass liberally to give depth to the slab. 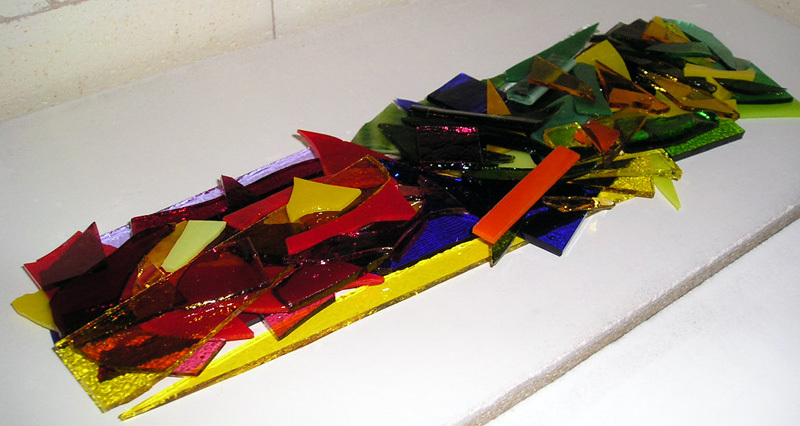 The pieces were all placed on a shelf prepared with Primo kiln wash. This was the second firing on the shelf. As usual, we did have a few problems. The kiln wash did stick to the opal offcuts on the bottom. Scrubbing removed some of the wash, but not fully. When we cut the slab up I will grind anything left over. It may be advisable to place a piece of clear on the bottom, or at least more clear or transparent and no opalescents. We did experience some devitrification as well, You can see this in a couple of photos. Again, once cut up those pieces will be cleaned by grinding before firing again. In subsequent fire polish firings I intend to use an anti-devitrification solution such as Super Spray. All in all, I am happy with the result. If you click on a photo you can see there is a lot of colour in the final slab, and a lot of it without devitrification. I should be able to cut out some nice features. The photos don’t do the puddle justice as a lot of the dark parts do show colour. I am hoping that once finished into features these will still look great.